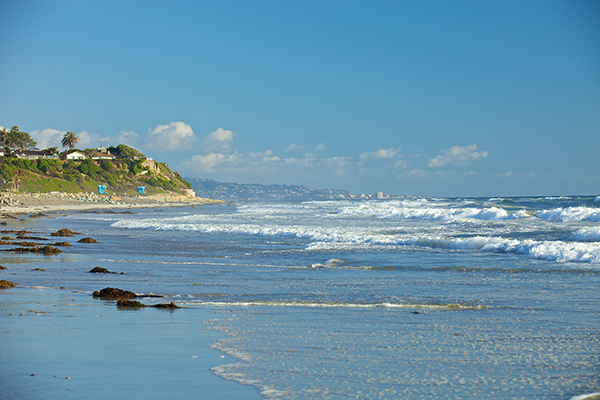 Solana Beach is a small, upscale city tucked between Encinitas and Del Mar. It is surrounded by the Pacific Ocean on the west, golf course and country club on the east, Lagoon Regional Park on the north, Del Mar Racetrack on the south with a population of 12,979. Solana Beach school rankings are among the best in the state, boasting scores in the high 90's. In 1998, Torrey Pines High School won the National Blue Ribbon for Academic Excellence. The middle school, Earl Warren Junior High has a new library, which is open to students during the day and to the public in the evening. Solana Beach starts at the ocean, rises into the hills then levels off. Interstate 5 runs through from North to South and divides the city. West of the freeway is the older part of town. East of the freeway is Lomas Santa Fe golf course. The last 25 years witnessed the building of over 70 percent of Solana Beach. The homes in Solana Beach are a mix and many overlook the ocean. Most of the new homes are East of the freeway. Residents have views of the Pacific Ocean and also of the inland valleys and mountains. Downtown Solana Beach has a quaint feeling to it and has antique shops, art galleries, restaurants, shops, hotels, nightclubs, resorts and apartment complexes. It also has beach access. Downtown San Diego is about 18 miles away with access by commuter train, though many residents choose to work in nearby La Jolla or the Sorrento Valley. Updated: 24th April, 2019 7:51 AM.